It is worth noting that in this post I portray student life in Germany from a master’s student perspective. My point of view is based on my personal experiences and what I’ve gathered from talking with other students. It’s probably also good to know what I’m comparing it to – my experience as an undergraduate engineering student at a BIG 10 school. This comparison is a little “apples and oranges” so as I try to keep that in mind, so should you. Master’s degrees are generally different from bachelor’s to begin with, so that may really affect my opinions. If you’re thinking about studying in Germany for higher education, you should be aware of the somewhat different university culture here. At first, you’ll notice that your weekly schedule is different here than it probably was back home. Coursework, exams, and papers have different focuses, requirements, and importance than they have in the States. On top of that, the basic teaching style and general philosophy of higher education are also different. As a result, student life in Germany could be much different than it would be for you back home. Classes and exams have a huge effect on student life, especially here. If you want to get your master’s here, you should be prepared for the adjustments you’ll have to make in order to succeed. Some of these adjustments are normal for any student beginning a master’s degree, but I think that some are more limited to Germany. My experience is limited, I’m in one program, at one school, in one city. Obviously, my experience isn’t indicative of German higher education as a whole, but I will try and point out things that I think are more likely in Germany. A crisp and sunny spring morning, not pictured: the omnipresent butter pretzel and coffee, staples of student life in Germany. Even before courses began last fall, I noticed a difference in the weekly schedule. The ratio of semester courses to the amount of class time per week is very different. Compared to my experience during my bachelor’s, I enroll in more courses per semester. However, I spend less time in class per course here. This obviously has an impact on my daily life. I spend less time in class, so I have more free time to study, pursue other interests, or just hang out in a Biergarten. Back at the University of Illinois, a typical 3-hour course would meet three times a week for 50 minutes or some equivalent split of meetings and class time. Of course, this rule had exceptions…(looking at you Physics)…but generally, this structure held. With more class time during the week, my days were busy with courses, homework, and meetings for group projects. 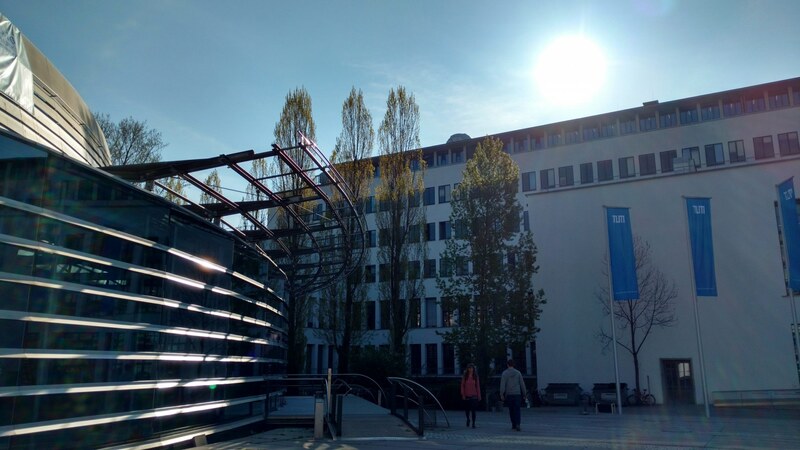 Here at TUM, a typical course most likely meets once per week for anywhere from 1.5 hours to 3 hours and 15 minutes. There doesn’t seem to be as much rhyme or reason to which courses require more class time than others as there was at Illinois. Courses worth the same amount of credits might have vastly different schedules or hours of class time. Other schools, or even other programs at TUM, might have a different or more methodical system for course credit. However, I think this is a trend in all master’s programs, no matter where you are. So, if you’re a master’s student – it’s likely more of the same. But, if you only have a bachelor’s under your belt, you’ll likely need to be ready for some changes. As I previously, said, most of my courses only meet once per week. 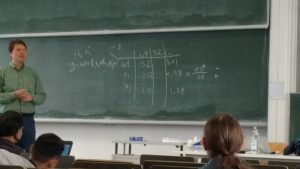 I’ve asked around to some German classmates, and (although my sample size is small) this seems to be normal here in Munich, and maybe in Germany as a whole. The only times I have had courses meet multiple times a week have been during “block lectures”. Block lectures are a series of intensive classes meant to “teach” you the material in a short amount of time. In my experience, these usually result from scheduling problems. One of the lectures in that Transport Statistics course I mentioned. So. Much. Stats. two weeks. The class consisted of several 3-hour classes per week in addition to problem set sessions. Woof. To be honest, I actually didn’t mind the first block lectures I had with the professor split between Munich and Singapore. His courses were very well structured, straightforward, and taught interactively. I realize that these are somewhat special cases. However, these block lectures are at the very least frustrating and at worst they significantly hinder our ability to focus on other courses. This effect is exaggerated at an especially critical time like the end of the semester. Students need to put off writing final papers, working on research projects, and of course, studying for final exams. Instead, these courses cram more information into your brain as you’re cementing together a semester’s worth of knowledge. Again, my experience is limited here, and block lectures may only exist at TUM for all I know. However, I think that block lectures are a rather visible result of a greater problem of the general university culture in Germany. Lectures are scheduled when they are scheduled. The material will be presented one way or another. If the timing is terrible for students, like a week of block lectures before exams begin, so be it. The department made some effort to schedule each of these courses more appropriately, but their hands were tied. This again may be more of a property of master’s programs everywhere, as students are expected to be able to independently study for the exams in a short amount of time. We actually could, possibly, maybe, have an actually “important” assignment or project due that’s worth some credit. These may sound like excuses from a petulant high-school student, and maybe they are. But, let me pose an idea to you. We actually are busy people. Even though I previously said that I’ve had more free time here, lots of things constantly chip away at it. Most of us work. Many of us live upwards of 30 minutes from the university. And usually, I have final projects to work on during the week or group projects to meet up for. Luckily, big additional assignments in my courses aren’t that common. I’d also like point out that I expect coursework depends greatly on your program and the professors. One of my courses did have regular assignments, and they helped to solidify the main ideas of the course. Unfortunately, this course was the exception to the rule. I think that a master’s degree in the US would be pretty similar to what I have described above. Graduate students are just expected to deal with a different style of teaching. However, all the German friends I have mentioned this to have echoed this theme of little coursework during the semester – in either bachelor’s or master’s degrees. So, how does this general lack of daily coursework affect my student life in Germany? Again, just like the more sparse class schedule, it gives me more free time. Hopefully, if you actually are assigned homework, it’s staggered between your classes. That way, you can focus on each assignment equally and give each one the thought it deserves. Unfortunately, in my experience there always seems to be one or two weeks when everything is due. This could be very different at another school, where professors may assign more or less coursework. 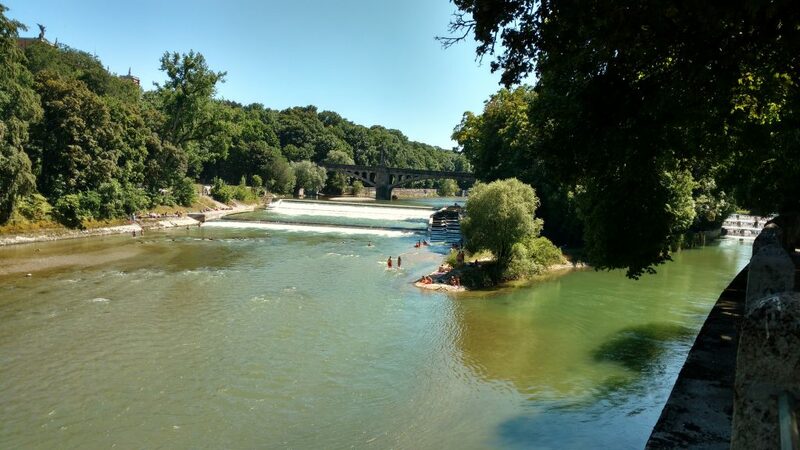 Of course, the exam period is during prime Isar-swimming time in the summer semester. During the month of July, probably all my time outside was biking to and from university… :/ It’s good to get out and enjoy the beautiful parts of Munich when you can, though (especially in between exams)! Exams and the exam period are definitely two of the biggest, if not the biggest adjustments to student life in Germany. Coming from a somewhat difficult undergraduate program, I was no stranger to stressful and challenging exams. At the University of Illinois during my time there, finals week was 6 days long. However, at TUM, final exams are stressful for different reasons and the exam period can span over a month. Final exams in my bachelor’s were grueling three-hour ordeals which tested your comprehension of the entire course. You need to think deeply about the topics and solve new complex problems intended to trick you (sometimes). In my program, and I think for TUM and maybe Munich as a whole, exams last one hour. That’s it. No matter how many credits the course was worth, or its complexity, you get one hour. One hour to scream through the exam, writing as fast as possible and never stopping. Did I mention that your performance on that one-hour exam is usually your grade for the entire course? That might add a tiny bit of additional stress to the whole process. You have to know the answer or how to solve the problem the moment you finish reading it. More often than not, the real crux of the exam is time management and/or your ability to write quickly. In my opinion, this isn’t right. Final exams should test knowledge and comprehension, not your ability to regurgitate lecture slides or your handwriting endurance. Hopefully this practice isn’t that common in Germany, because it really is one of my biggest gripes with my program. I think I would much rather have a bit more work to do during the semester to keep myself on track than crunch everything into a week at the end. I could go on for a while about final exams, but there is another part of the exam period that I need to mention. Many courses will not have a final exam, but a final project instead. While this is less stressful than an hour-long writing sprint, it also has its drawbacks. Work can pile up at the end of the semester if you have several courses with final projects. For me, final projects have often required both a presentation (which was not always graded, but mandatory) and a final paper. Just like with those not-so-relevant homework assignments, the extra work required for an ungraded presentation just doesn’t seem worth it to me. Of course, your circumstances will depend on your professors, too. Just be ready for everything to be down to one final project. As you may have noticed, most of my coursework actually takes place in the last few weeks of the semester. This is a huge part of student life in Germany. During the semester, instead of building up grades through mid-terms, quizzes, homework, and other assignments, I just listened and took notes in lecture. In my opinion, this isn’t a constructive way of teaching material. Really, it seems like a remnant of university studies in the 19th century. This schedule crams learning and studying into a couple of weeks before the exam. In the end, this makes all the information of the course much harder to retain long-term. Isn’t that the point of education? Make sure to check out the grading system and the structure of your classes before choosing a program to attend in Germany. It’s likely that everything will be down to a final exam or a final project, so be ready. It can have a big effect on your life. To sum all of that word salad up… student life in Germany is different. Being a master’s student is different than being a bachelor’s student. This post is just the first of what I think will be many posts on the topic. Class and exams really impact not only the daily life of students but also on these bigger cycles of work and stress. The course schedule is different from what I was used to. Homework and assignments are much more rare. And last but certainly not least, the exam period is intensely stressful. Some of these differences are a result of my program and professors. It could be that master’s programs are just different than bachelor’s programs. Or it could be that some things really are done differently in Germany. Or, it could be all three. I have tried to adjust to these changes, and I’ve done pretty well. Hopefully you can learn from my experiences so you’ll have some idea that your student life in Germany may not be what you expect. If you go into a big change like starting a master’s program in another country, you need to expect there to be some differences. I’m just here to make sure you know that. If you have any questions about what I’ve said above or have something to add, leave a comment below or contact me with the form here. I’d love to hear your response. Keep checking out the site regularly or sign up for the newsletter for more content like this! Americans don’t belong in any European nation. Trump, please build a wall and keep them in! Yes, of course. American students really are a scourge on the world…what with our tipping and being easy to talk to! Actually though, PCB during spring break kind of is a scourge on the world. But that’s domestic, so no worries there. I’m also not sure if you’re trolling or not. So, are you being serious or not? Edit: for those who might not get it, I’m joking about the American stereotypes I listed above…just see my discussion post about American Stereotypes and you’ll see my point of view on such things. Always money with you yanks. Americans don’t belong in Europe for anything longer than a holiday. You’re uncultured, loud and annoying degenerates. We are perfectly entitled to remove you from our homelands. The Native Americans would wish they did the same. You’re universally despised around the globe for a reason. Good lord mate, where did you think Americans came from? There is no such thing. Europeans escaping from religion and bad economy came to America; that’s as simple as it can get. This is a positive blog, let’s keep it this way please. Alright – anyone who might be reading this thread – I’m going to keep this comment here as an example of exactly what I do not want on this blog. This Walter person is probably a troll anyway, but whatever he is, he’s symbolizing exactly what this blog is against – narrowmindedness. He, unfortunately, doesn’t see the irony in his stereotyping of Americans with the same bad attributes he’s displaying by writing such comments. Learn from him, think critically about your ideas, don’t be judgmental! With that, I will no longer feed the troll.